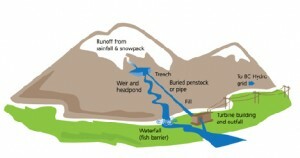 The BroomPower scheme is located on the steep burn “Allt a’ Mhuilinn” (mill burn). As you travel from Ullapool towards Inverness it is on your left just before you climb out of the glen at the famous Corrieshalloch gorge. The scheme is “run of river” which means that there is no storage pond or dam – instead we use a portion of the water flowing in the river. Of course the river flows vary naturally on a daily basis and therefore the amount that can be extracted also varies: the licence conditions set by the Scottish Environment Protection Agency (SEPA) sets limits to ensure that there is always sufficient water downstream of the intake in order to protect the aquatic ecology. From the intake high up on the hillside, a pipeline delivers the water to the turbine situated close to the road. The power for the turbine is determined by the amount of water flowing through the pipe and the height difference between the intake and turbine. 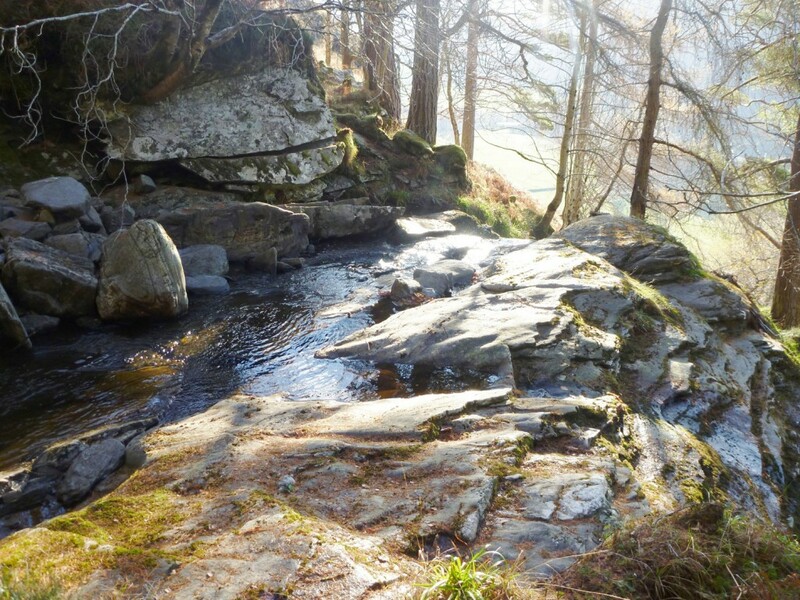 The Allt a‘Mhuilinn is very steep and the catchment very wet which makes it ideal for hydropower. Although the maximum that can be generated by our turbine is 100kw, on drier days it will generate less and sometimes nothing at all. The good news is that the variation over a typical year is well understood and over the long term it is possible to confidently predict the amount that can be generated year by year and that the dry years are cancelled out by the wet. The river and the surrounding land have been leased from Forestry Commission Scotland (FCS) under the National Forest Land Scheme. This lease runs for 40 years with an option to renew for another 40 years. The construction, as far as possible, uses existing forestry access tracks and roads. A detailed ecological survey has been completed and although most of the land is cleared commercial forest, a small stand of native woodland was bypassed and enlarged by planting suitable native broadleaf trees. Electricity generated by BroomPower is exported to the National Grid and income from this will be considerably enhanced by the Government Feed-in Tariff (FiT) for the first 20 years. Of course BroomPower will continue generating for much longer with income then solely derived from the sale of electricity. 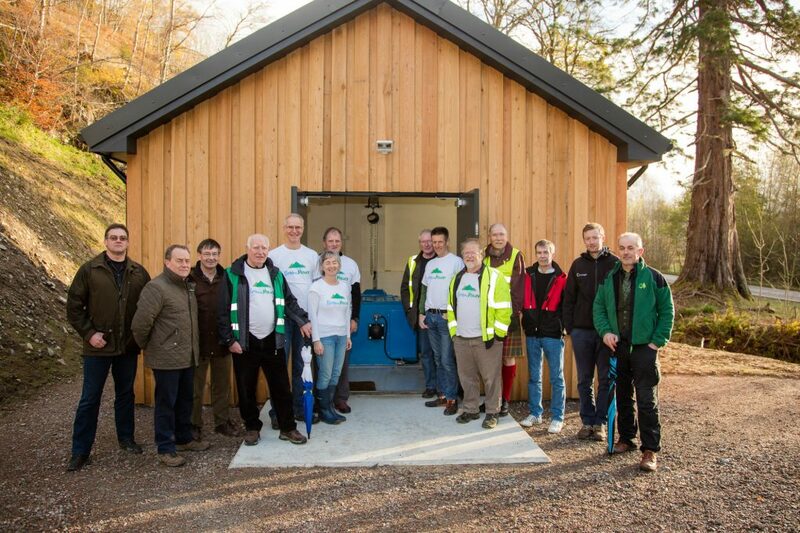 There are many examples of schemes built in the Highlands in the 50’s and 60’s which continue to work to full capacity and even some Victorian and Edwardian built hydro-schemes which are still in operation. Construction began in Apr 2017 and generation at the end of 2017. Revenue from generation and the FiT scheme began in Q1 2018. 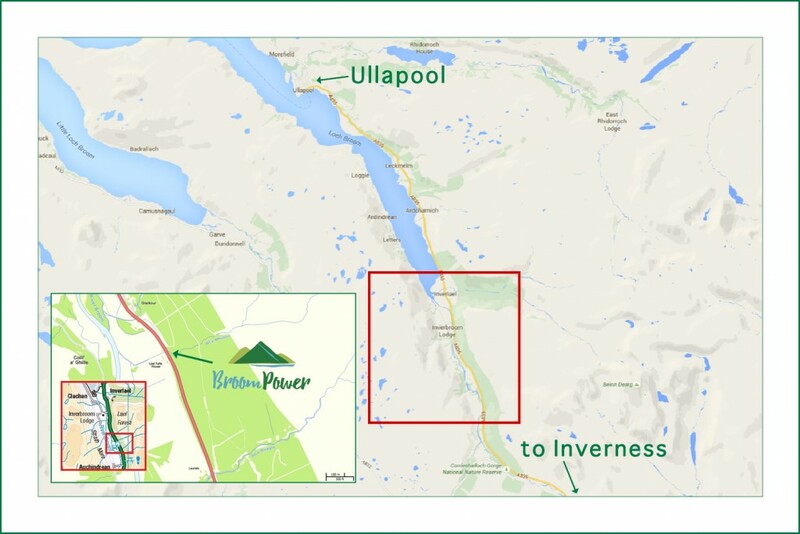 For more technical details of the hydro see the Feasibility Study we carried out in 2015.